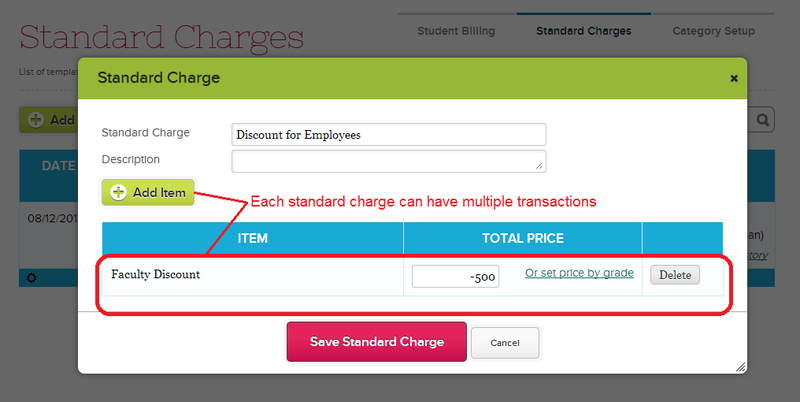 The QuickSchools Standard Charges module is actually a very powerful tool for applying discounts and charges based on group of students. For example, you may have a discount for siblings, or a discount for veterans, or a discount for employees. 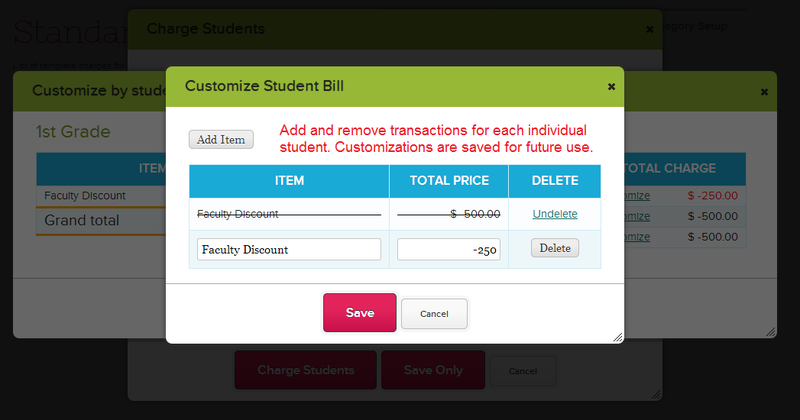 Although the Fees Tracking module may not know automatically if a student is deserving of one of these special discounts, once you include a student into a standard charge, the Fee Tracking module remembers this, so you can re-apply the same discount/charge in the future. One you’ve saved the Standard Charge, it’ll appear in your list of standard charges. When you’re done, clicking on “OK” will bring you back to the previous screen. You can then go ahead and click on “Charge Students”. The important thing to note here is that if you click on “Apply” again, all the students and customizations you had entered previously remains. So you can re-apply the same charges or discounts to the same group of students over and over again as desired. You can of course make changes to the list of students or to the student-customized transactions as necessary, before re-applying the standard charge. Charges / Discounts for Siblings: Create a Standard Charge and only include the appropriate siblings for which the charge/discount should be applied. Depending on your discount structure, you may need a separate “First Sibling Discount”, “Second Sibling Discount” and so on. Charges / Discounts for specific courses / subjects: Create a Standard Charge for a specific course or subject, and include only those students into the Standard Charge. Financial Aid: Create a Standard Charge for the Financial Aid, and include the appropriate students into the standard charge. 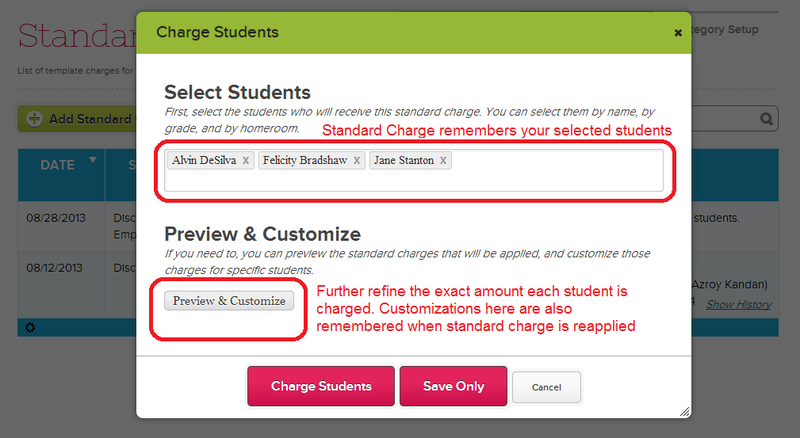 You can then customize the charge for individual students when the standard charge is applied. Scholarships: Similar to Financial Aid, simply create a Standard Charge for the scholarship (you may offer different scholarships with different names), and include the appropriate students into the standard charge. You can use negative dollar amounts to denote receipt of funds from the school to the student, either for a discount, a scholarship, or financial aid. Remember that although you have to manually include students into a Standard Charge, once the Standard Charge is created, you can re-apply the charge multiple times to the same group of students. You only need to include the students into the list the first time, because the Standard Charge remembers who’s included in the list for future applications of the charges. 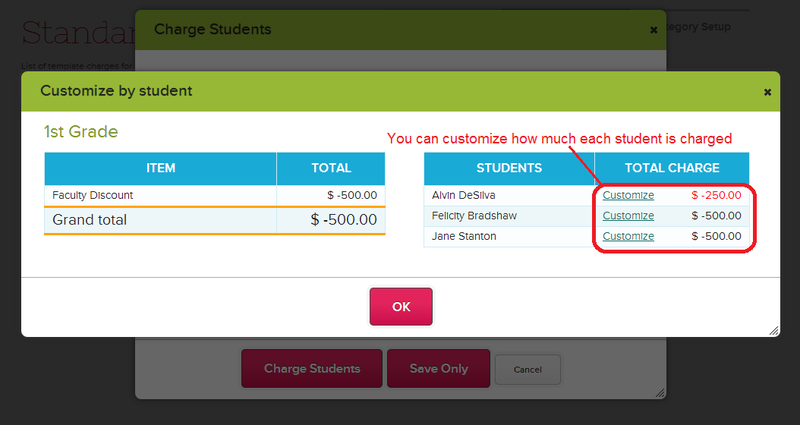 You can also customize the charges for each student when applying the charge as well.